"DoHistory invites you to explore the process of piecing together the lives of ordinary people in the past. It is an experimental, interactive case study based on the research that went into the book and film "A Midwife's Tale", which were both based upon the remarkable 200-year-old diary of midwife/healer Martha Ballard. Although DoHistory is centered on the life of Martha Ballard, you can learn basic skills and techniques for interpreting fragments that survive from any period in history. We hope that many people will be inspired by Martha Ballard's story to do original research on other "ordinary" people from the past." In their attempt to realize their ambitious goals, the DoHistory team has produced a remarkable website combining an excellent web interface with an extensive database including images of primary resources, numerous tools for accessing those documents in various ways, interpretative presentations, and educational materials. The site incorporates a wide range of the available web techniques in ways appropriate to enriching the surfer's experience without overwhelming them in flashy, meaningless techno-glitz, an accomplishment not easy to achieve. As an experimental site, the audience for this site is primarily students and scholars. This audience is well supported by extensive remarks on the use of the site as a teaching tool and in the provision of lesson plan ideas and topics. For scholars the website is remarkably open about what it is attempting to accomplish and the motivations for the material presented. A slightly incongruous element to the site is the inclusion of two advertisements aimed at selling copies of "A Midwife's Tale" in book and film form. Perhaps the site should have included them in the links sections. The stated goals of the project firmly place this work in the arena of social and cultural history. Ulrich's book, upon which this site is based, provides an excellent example of a study on the life of women in 18th and 19th century America. The scholarship displayed in the site is thorough and up-to-date as exemplified by the extent of the primary resources used and the methodologies used. A prime example of methodology appears in the comparison of the roles of 18th century midwifes and doctor-surgeons and the process by which doctors eventually supplanted midwifes in medical practice. This site does not fit neatly within any one of the genres identified in the JAH Review Guidelines. It combines the features of an archive, electronic exhibit, a gateway, and a teaching resource. DoHistory's archive provides images of the primary texts form Martha Ballard's diary and Henry Sewall's diary supported by published transcriptions of Ezra Stiles' and Martha Ballard's diaries, and a wide range of materials including maps, letters, money, newspapers and journals, public records, reference works and more. This array of material provides a rich resource for studying midwifery and the community of Hallowell in the late 18th and early 19th centuries. As an electronic exhibit DoHistory provides an interesting insight into Martha Ballard's diary and the uses of primary source materials such as diaries and letters in the reconstruction of history. 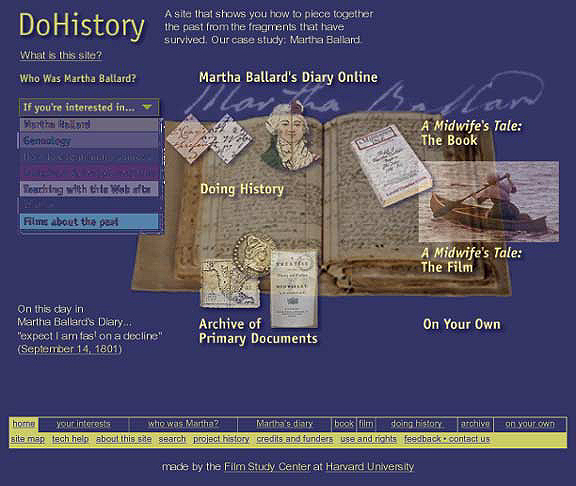 The primary exhibit portion of the site consists of the two in-depth interactives under "Doing History," the images of Martha Ballard's diary itself with transcription, the excerpts from the Laurel Thatcher Ulrich's "A Midwife's Tale" based on the Martha Ballard's diary, and the video clips from the film based on Ulrich's book. The DoHistory website has an excellent opening interface - it allows you to get an overview of the basics of the site without having to click endlessly into the site. Particularly useful are the navigational tools including drop-down menus and short summaries for each which appear when the mouse courser moves over the screen link. Navigation throughout the site is easy and straightforward, particularly important for a site of this depth and richness. This being said, once you get beyond the opening pages for the site gets bogged down with numerous pages consisting of instructional text intended to enable the surfer to get the maximum benefit out of the tools and layouts provided. This means that as a surfer you may be forced to click forward through several pages before you get to the "meat" of the section you wish to look at. The tools supplied by this site set a high standard for future web sites dedicated to researching or providing access to primary documents. The "magic lens" tool is especially useful, enabling non-specialists to read a transcription of Martha Ballard's diary while still being able to view an image of the original pages. This is a great tool for users wishing to learn about how to read written texts from the period - comparable to the "Everyman Classics" series of books on classical works in which the text is rendered in the original language (Latin or Greek) and in English on facing pages. Overall, the DoHistory site has provided an impressive resource for studying and teaching American history. It makes effective use of new media to provide access to a huge amount of material that would be otherwise very difficult to access. In the sheer volume of material made available in various forms, this site represents a substantial step beyond that which could have been done in any other media form. The combination of tools and various methods of accessing the primary texts provides an experience not easily available in other formats.